Walking in a suburban creek-side park, south of downtown Brampton, Ontario on November 10th 2015, around noon. 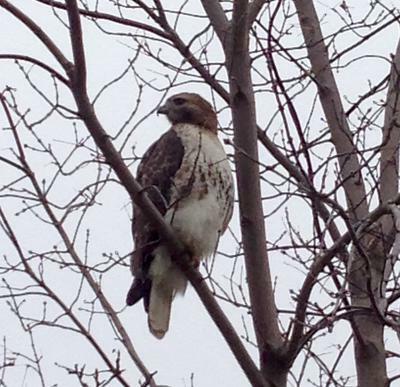 Saw the Hawk in a smaller tree, surrounded by cut grass (lawn), near the walking path. After an initial look, it didn't pay much attention to me, it seemed much more interested in what might be in the grass. It was very relaxed around me, as I was quiet, the bird was perched on one foot. It allowed me to get quite close, and didn't make a move to fly away. The Hawk was keeping a close eye on the ground all around the tree. 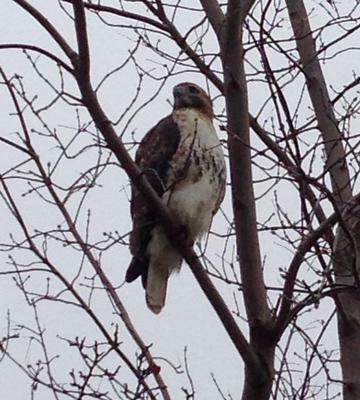 Thanks for your report and great pictures - I think one of our readers will be able to identify your mystery Hawk!